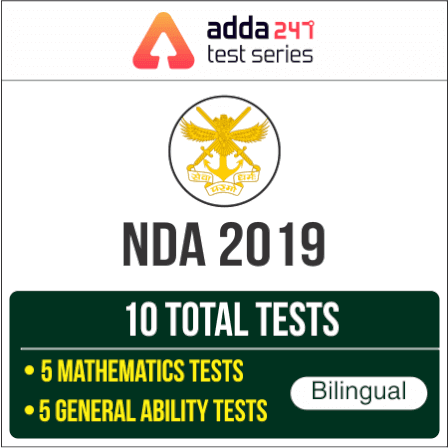 Dear Students, Defence Adda is providing you all with this quiz on General Knowledge questions for NDA & Other Defence Exams. Q1. Which one of the following National Highways links Jabalpur, Nagpur, Hyderabad, Bangalore and Madurai? 1. The Buddhists in Deccan excavated rock-cut Chaityas and the Vaishnavas, Shaivas and Jainas imitated these in later centuries. 2. The Vaishnavas, Shaivas and Jainas excavated temples at sites far distant from rock-out Chaityas. Q4. Which one among the following countries is not touched by the Stilwell Road constructed during the World War II? Q6. Where is the Nanda Devi Peak located? 1. No person is eligible for appointment as Governor unless he has completed the age of thirty years. 2. The same person can be appointed as Governor for three States. 1. A bill pending in the Legislature of a State shall not lapse by reason of the prorogation of the House or House thereof. 2. A bill pending in the Legislative Council of a State which has not been passed by the Legislative Assembly shall not lapse on dissolution of the Assembly. Q9. Which one among the following statements regarding the Eighth five-year plan in India is not correct? Q10. Which among the following statements is/are true about WTO membership? 1. All WTO members automatically receive the ‘most favored nation’ status. 2. Over 75% of WTO members are from developing countries, WTO membership allows them access to developed markets at the lower tariff. Sol. National Highway (NH 7) deals with Varanasi and Kanyakumari. It is the longest Highway of India. Sol. A Chaitya is a Buddhist shrine including a stupa. Sol. Second International (1889-1916) was the original socialist international. It was an organization of labour and socialist parties which was formed in Pairs in 1889. Sol. The Ledo Road (from Ledo, Assam, India to Kunming, Yunnan, China) was built during World War II so that the Western Allies could supply the Chinese as an alternative to the Burma Road which had been cut by the Japanese in 1942. It was renamed the Stilwell Road the Japanese in 1942. Sol. Nanda Devi Peak (7817 m) is situated in Uttarakhand.